Thank you very much for the description of your point operating arrangements and for the helpful photographs. I have started to find below-baseboard point motors to be an irritation and have used Kato track on my most recent layout for this reason. But I really want to use Peco track again and have been mulling over some form of 'wire in tube' or 'bicycle spoke' operation. I had been wondering about combining this with Peco point motors; your solution is ideal. Thank you very much indeed for taking the time long to explain this so clearly. Under close supervision from the gang master, good progress has been made by the PW gang today. The majority of scenic side track is now in position (held with pins but not stuck down). All live frog droppers are in place and some DC feeds...... next steps will be a continuity/isolation test, Uncoupling electromagnets, point motor wires-in-tubes and base board joints when the coper clad board arrives. Lots to do but no hurry as I must do some more on my 00 before the grandsons come to play. It certainly is great progress, Dave. The Head Ganger has obtained maximum productivity! What's the Head Ganger's name? By the way, it looks to me from the arrangement of the goods yard that you have decided not to include the kick-back siding we discussed earlier. If so, I think you have done the right thing. Shunting it would either have been fascinating or a nuisance, according to your point of view. The arrangement of your branch line platform on a loop is a lovely idea. It sort of slightly reminds me of Oxenholme or Dunblane. A nice variation from a bay platform. Thanks John..... Oscar is a hard taskmaster. I took feedback from many great contributors to this forum (Note to moderators - this really is a "friendly" forum) on the track plan and liked your suggestion on ditching the kickback so thanks. In the end, if its not perfect/prototypical, so be it......sometimes you have to "just do it". I love the gentle curve into the station and the goods yard area is simple and not overdone. Looking forward to seeing more progress. 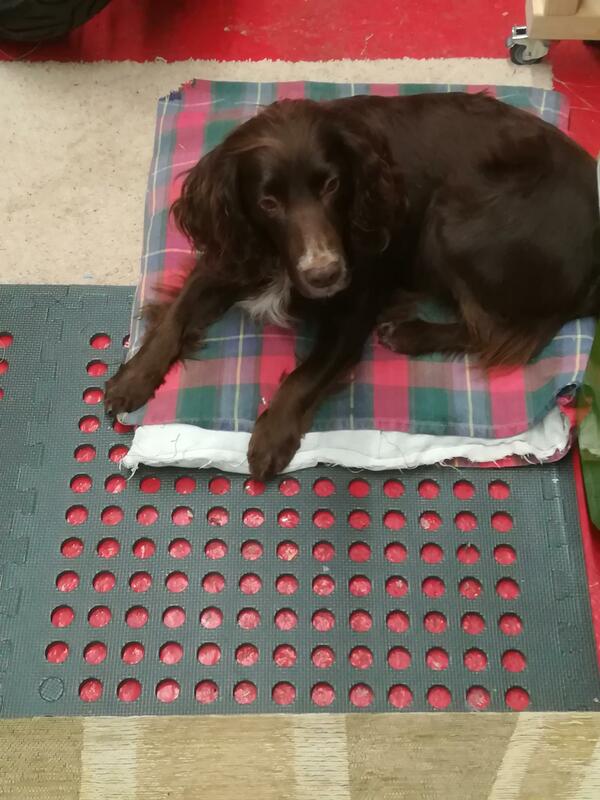 Hopefully Oscar will keep you on your toes (though he does look rather laid back). Not much progress at Charlport Junction to show in pictures. Having fitted locking hinges to the split fiddle yard, I discovered that, when folding away as two separate pieces, the baseboard joins interfered with each other. I have now re-engineered the fold down section to operate as one piece, but retained a split in case the thing ever needs to be taken apart. Hinges have always been my nemesis. All point motors and wire/tubes now installed - just waiting for more accessory switches to arrive. Next step - the dreaded copper clad baseboard joins. Next step - the dreaded copper clad baseboard joins. Rather you than me, Dave. Baseboard joins are my most potent aversion (apart from people that are unkind to children or animals). In the interests of a happy life, I have resolved to never have any baseboard joins again. I wish you the very best of British luck with the joins. They say you can't make an omelette without breaking eggs....... track laying at Charlport Junction is progressing well, along with my own job creation scheme for the cleanup team. 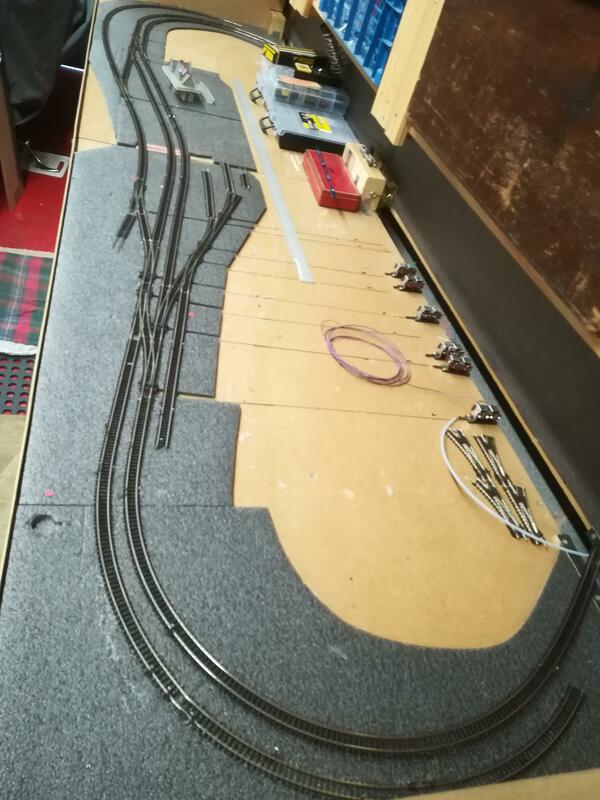 Taking a gamble with the set track insulfrogs in the fiddle yard - should be able to swap easily if they become an issue but I want to keep the yard as simple as possible. Guess it depends what you'll be running, Dave. 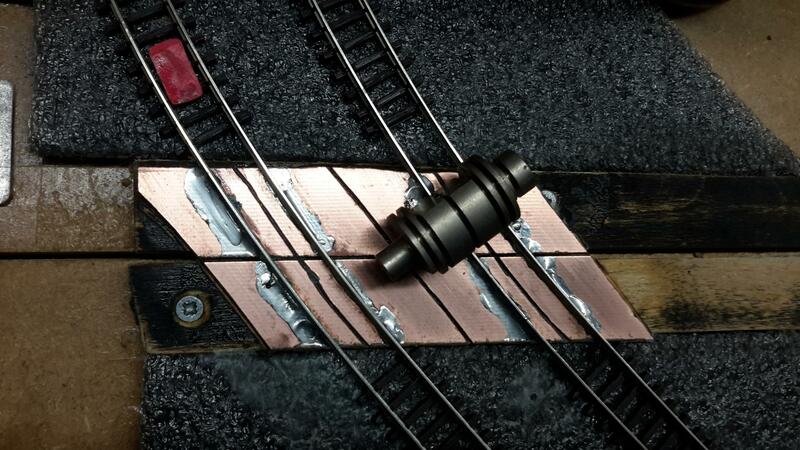 What will you be cutting the tracks over the join with? Looking good and nice straight track. 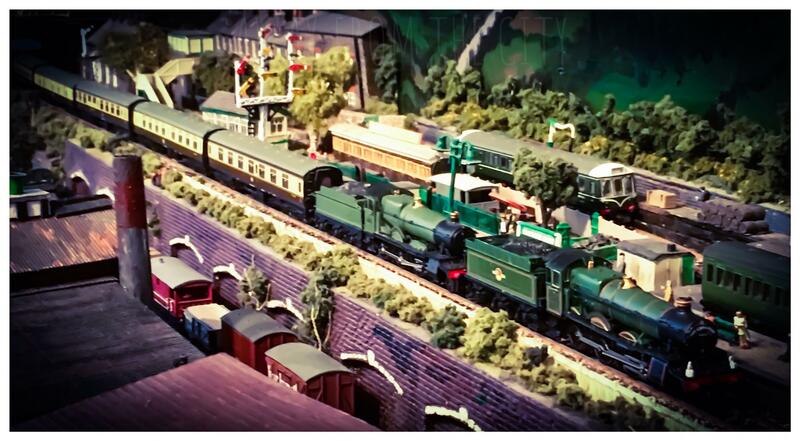 Well it's all been a bit quiet at Charlport Junction recently. 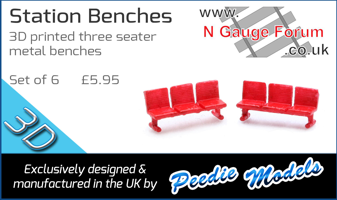 "Minding" sick grandchildren, fine weather for gardening and waiting for modelling orders to arrive have all but stalled progress. 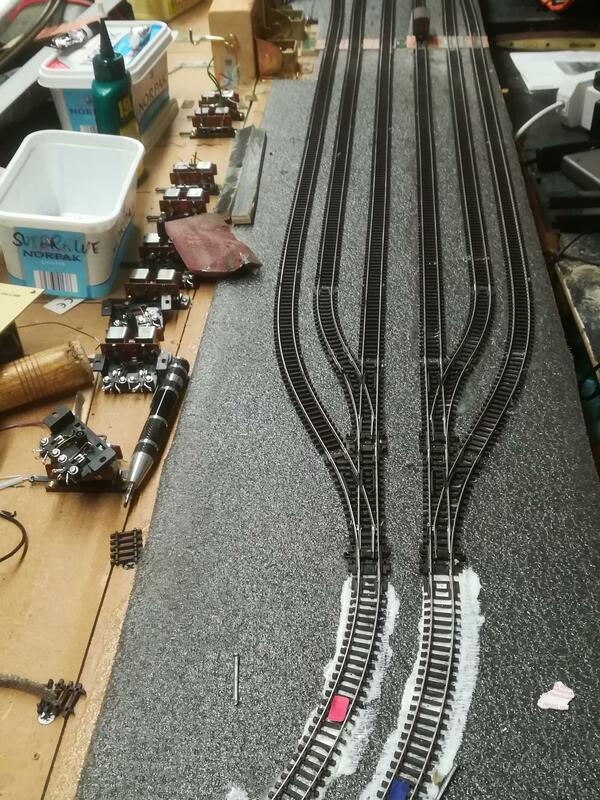 All mainline and branch line track is now laid and stuck down, as is the fiddle yard........ just the siding to lay but this will probably wait until the goods yard/station forecourt are better defined in my head. All points are now connected to their motors (except storage yard which remains manual until I know if I can trust the settrack points) via wires inside ptfe tubes - note the tactical avoidance of W. I. T. reference as it has had the potential for confusion in the past. All points droppers are dropped. 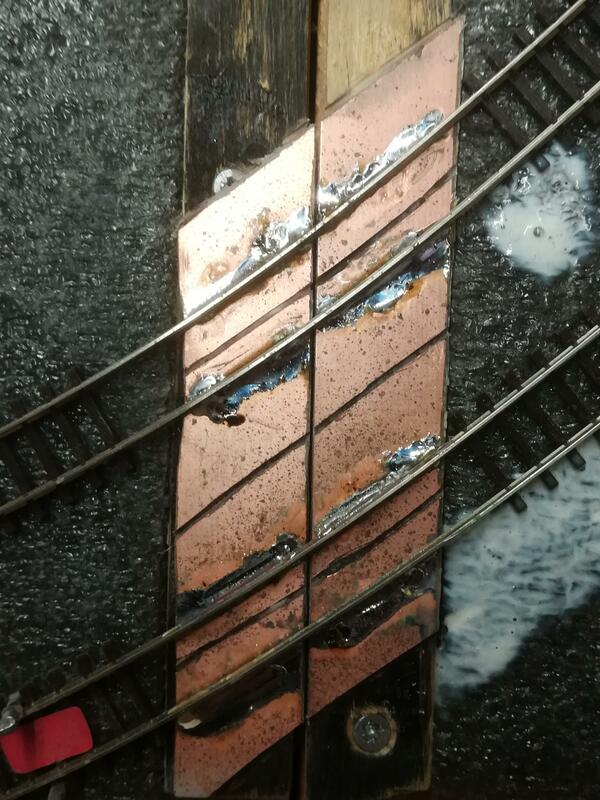 Next step is to finalise the uncoupling locations and fit electromagnets. Once that's done, progress will move to wiring in the feeds, frog switches and tag strips for linking back to the control panel. Also, track at baseboard joints has yet to be cut - this will wait until electrical continuity and smooth running has been confirmed. Pics will follow once I have had time to tidy up.